Ofotfjord (Ofotfjorden (Norwegian) or Ufuohttácode: sme promoted to code: se (Northern Sami)) is a fjord in Nordland county, Norway. It is an inlet of the Norwegian Sea, located about 200 kilometres (120 mi) north of the Arctic Circle. The 78-kilometre (48 mi) long Ofotfjord is Norway's 12th longest fjord and it is also the 18th deepest, with a maximum depth of 553 metres (1,814 ft). In the English language and in many historical documents, this fjord is often referred to as the Narvik Fjord because the town of Narvik is located on the inner shores of the fjord, but this is not an official name of the fjord. The fjord is surrounded by mountains, some reaching 1,500 metres (4,900 ft), and even 1,700 metres (5,600 ft) in Skjomen, where the Frostisen glacier can be seen. 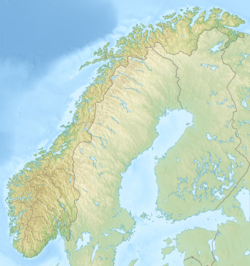 The only large lowland area is on parts of the northern shore, around Harstad/Narvik Airport, Evenes, although there are smaller areas near the fjord and in narrow valleys (for instance, the Narvik peninsula, where the harbour and city centre of Narvik is located). The mountains are covered by forest below elevations of 500 metres (1,600 ft), birch being the most common tree, but pine and aspen are also common. The bedrock around the fjord consist of both hard minerals like gneiss and granite as well as softer minerals rich in lime; there is a dolomite quarry in the municipality of Ballangen (photo). The surrounding Ofoten district is named after the Ofotfjord (Old Norse: Ófóti). The meaning of the first element is unknown and the last element is derived from the Old Norse word fótr which means "foot". The oldest form of the name could have been Úffóti. In this case, the first element is úfr which means "Eurasian eagle-owl". The three inner branches of the Ofotfjord might have been compared with the three claws of an owl. The Ofotfjord is the longest fjord in Nordland county and the fourth longest in Northern Norway. The municipalities of Tjeldsund and Evenes are located on the northern shore, the municipality of Narvik is located on the eastern, innermost part of the fjord, and on the southern shore is the municipality of Ballangen. The municipality of Lødingen (and beyond that Lofoten) and the large Vestfjord is located west-south-west of the Ofotfjord. Several smaller fjord branches extend from the main fjord. From north-west, going clockwise, these are: Ramsundet (which is actually a narrow strait connecting with the larger Tjeldsundet), Bogen (a fairly wide bay), Herjangsfjord (the widest of these branches), Rombaken (which is crossed by the E6 highway using the Rombak Bridge), Beisfjorden (crossed by the E6 highway using the Beisfjord Bridge), Skjomen (the longest of these fjord branches, crossed by the E6 highway using the Skjomen Bridge) and finally Ballangen. At the mouth of Ofotfjord, on the southern side, is another fjord, the narrow Efjorden, which extends southeast (crossed by the E6 highway using the Efjord Bridges). Herjangsfjord in the foreground and Ofotfjord in the background, pictured from the north side. The Ofotfjord has a rich marine life, with huge quantities of herring staying in the fjord in the winter. These fish attract a lot of whales (orca). Divers have occasionally observed lobsters in the fjord, the northernmost sightings of lobsters in the world. Cod, as well as coalfish, are the most common fish species throughout the year. Mackerel is common from July to mid-September. Sea eagles and otters have made a strong comeback and are now very common in and around the fjord. Sea gulls are common all year, and many migratory birds arrive in summer, such as oystercatchers and grey herons. In the Battles of Narvik in World War II, the Ofotfjord was the scene for several naval battles, and many ships are resting at the bottom, especially in the vicinity of Narvik harbour. These are very popular among divers. However, some of these ship wrecks are declared war graves and are thus protected by law. The German destroyer Georg Thiele was scuttled and is still visible from around the railway between Straumsnes and Rombak railway station. ^ European Research on Cetaceans. Cambridge: European Cetacean Society. 2004. p. 111. Retrieved January 8, 2019. ^ Skjoldal, Hein Rune (2004). The Norwegian Sea Ecosystem. Trondheim: Tapir. pp. 213, 247, 252. Retrieved January 8, 2019. ^ a b c "Stadnamn og skrivemåten for stadnamn" (in Norwegian). Kartverket. Retrieved 2019-01-03. ^ Store norske leksikon. "Ofotfjorden" (in Norwegian). Retrieved 2012-05-18. ^ Thorsnæs, Geir, ed. (2017-02-13). "Ofoten – tidligere kommune". Store norske leksikon (in Norwegian). Kunnskapsforlaget. Retrieved 2019-01-03. Wikimedia Commons has media related to Ofotfjorden. This page was last edited on 9 March 2019, at 07:26 (UTC).